All tea plants are members of the Camellia Sinensis species, but there are a great many cultivars, each with their own unique characteristics and qualities. Some are more resistant to the cold, for example, or to certain parasites. Others produce a more abundant crop. 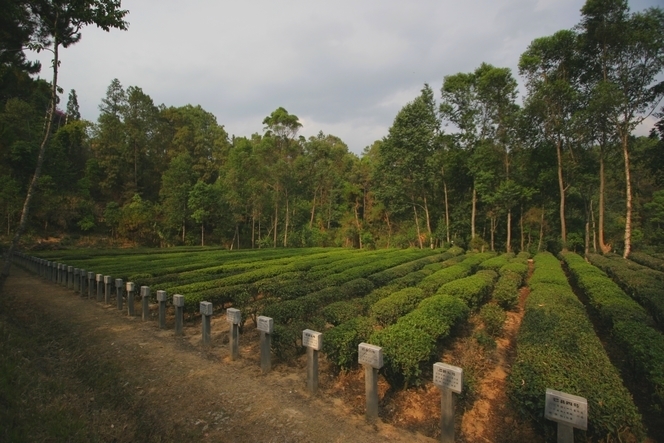 Here, in Feng Qing, near Lincang (China), tea planters breed a wide variety of cultivars in order to experiment with grafting, for example, to produce new hybrid tea plants. I visited this tea garden last year between two tastings of Pu Er, the main tea found in the region and manufactured from a cultivar called “Da Ye” (big leef). Moreover, it’s here, near Lingcang, that the old tea and horse exchange road comes by. Thank you for your blog and your beautiful pictures! You’ve got a nice occupation! I really like Pu Ehr tea, and its benefits! Thank you for sharing! The photos are beautiful, and your writing is informative, personal and thoughtful. I will be returning regularly. Here we have, from left to right: B157, P312 and AV2. These are their familiar names. Their full names are as follows: Bannockburn 157, Phoobsering 312 and Ambari Vegetative 2….